Inside the Office of "The Office"
Of course, just like in your actual office, when people come and go and new names appear on the front of the building, the floor plan of the actual office changes. Fortunately, there are plenty of obsessive Office fans out there on the interwebs, documenting each and every change to the Dunder Mifflin cubicle seating chart. Season two is arguably when the US version hit its stride. This is the season when Jim temporarily relocated Dwight’s desk to the men’s room, and found his own seat relocated to the Annex when someone left Michael a little present on his carpet. Also worth noting on this map: Vance refrigeration, over by the elevators. We’re surprised that Bob Vance didn’t find a way to slap his branding all over that section of the chart. In the third season, Jim moved to the Stamford branch and started dating Karen, who then moved with Jim (and most of the Stamford branch) back to Scranton when the Stamford branch closed. Confused yet? Not as confused as you would have been, had Michael not driven most of the former Stamford-ites crazy on their first day, causing them to quit. We found some weird, weird stuff while we were looking for these charts. (Let’s just say, a lot of people have even more time on their hands than we do.) 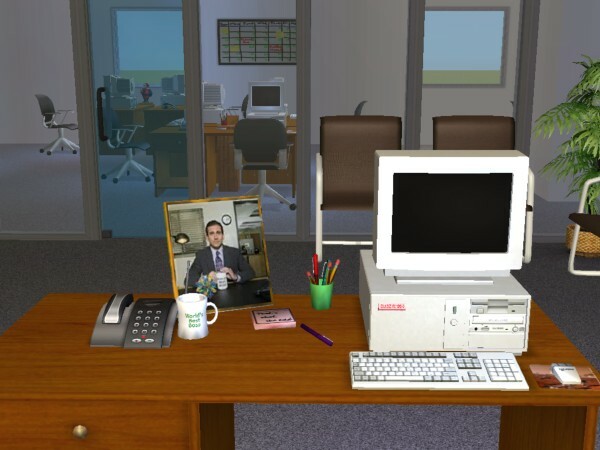 The greatest of them all, though, might be The Sims environment mockup of the Dunder Mifflin office.